How Does Oscars Voting Work? Every year when the Oscar nominations are announced there is much made of the surprises and snubs. Everyone puts in their two cents worth about what they got right and what they got wrong, and then it all happens again when the awards are presented. But very few people actually know how the process works. How are the nominees selected? How are the winners determined? Allow me to try and shed some light on the mechanisms of the Academy Awards. To get to the bottom of this we must first ask, who is the Academy? The Academy Awards are presented by the Academy of Motion Picture Arts and Sciences, a professional organisation dedicated to the advancement of motion pictures. The Academy has just over 7,000 members, the majority of whom are based in the US, and is broken down into seventeen branches: actors, casting directors, cinematographers, costume designers, designers, directors, documentary, executives, film editors, make-up artists and hairstylists, music, producers, public relations, short and feature animation, sound, visual effects and writers. In 2012 the Los Angeles Times did a survey of roughly 5,000 Academy members and found them to be 94% white, 77% male and 86% over the age of 50. Make of those numbers what you will. Membership of the Academy is by invitation only. Once a year the Academy’s Board of Governors extends invitations to individuals to join the Academy based on the recommendations of the different branch committees. The primary way that people become members of the Academy is through the Awards, with Oscar nominees automatically considered for Academy membership. But if you are not an Oscar nominee you have to be sponsored by two Academy members who can attest to your having an “unusually high level of quality and distinction” in your field. So it is not an easy club to get into. So now that we know who the Academy is, we can get down to how the nominees are selected. Every year there are hundreds of films released that are eligible for Oscar consideration. The basic eligibility criteria is that a film must be of feature length (over 40mins long), must be exhibited publically in Los Angeles for at least seven consecutive days, and its theatrical run must have been its initial release (so no TV or On-Demand movies). With so many films it is just not realistic to assume that an Academy voter is able to see every eligible film in preparation for sending in their nominations. Therefore, from the studio’s perspective, half the battle is making sure your film is front of mind come nomination time. 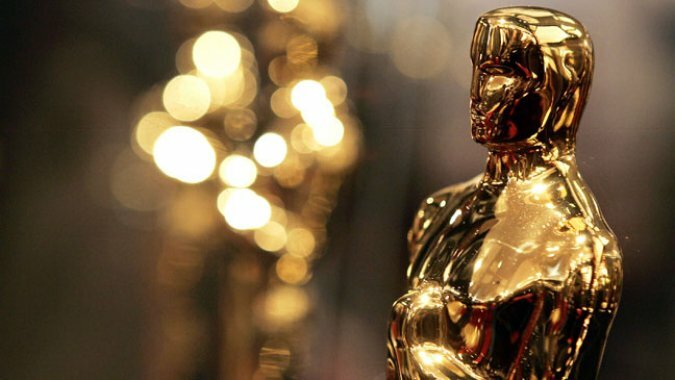 The nomination process starts in late December, so studios will tend to release their films that they believe have Oscar potential in late November or early December so that they are fresh in the minds of Academy voters when it is time to put in their ballots. All active members and life members of the Academy are entitled to vote in the Academy Awards, which equates to just over 6,000 voting members. For most of the awards, nominees are chosen by the members of the corresponding branch of the Academy. So actors nominate actors, cinematographers nominate cinematographers, editors nominate editors and so on. Different categories have their own little quirks. For example, in the acting categories it is up to the individual voting member to determine whether an actor is leading or supporting, but the performance will only be considered in the category for which it receives most votes. It is therefore possible for a performance to miss out because its votes are split between categories (this makes the “For your consideration” advertising campaigns studios run quite important in directing the voter to a specific category). Similarly, an actor cannot be nominated twice in the same category in the same year. As before, the higher polling of the performances will receive the nomination. There are some categories – Best Foreign Language Film, Best Animated Feature – which have different voting rules. The Academy assembles an Animated Feature Film Award Screening Committee for whom they screen all of the eligible feature animations of that year. Members of this committee then put forward the nominees, but a member must have seen at least 66% of the eligible films in order for their nomination to count. When it comes to the foreign films, the first round of culling is done overseas. Each country is only allowed to put forward one film and it is up to that country to select its chosen film. The Academy then assembles a Foreign Language Film Award Committee who will determine the five nominations from this collection. The Best Picture category is slightly different. For starters, all voting members of the Academy are entitled to submit their Best Picture nominations. It is not restricted to a particular branch. Secondly, there are a different number of nominees. 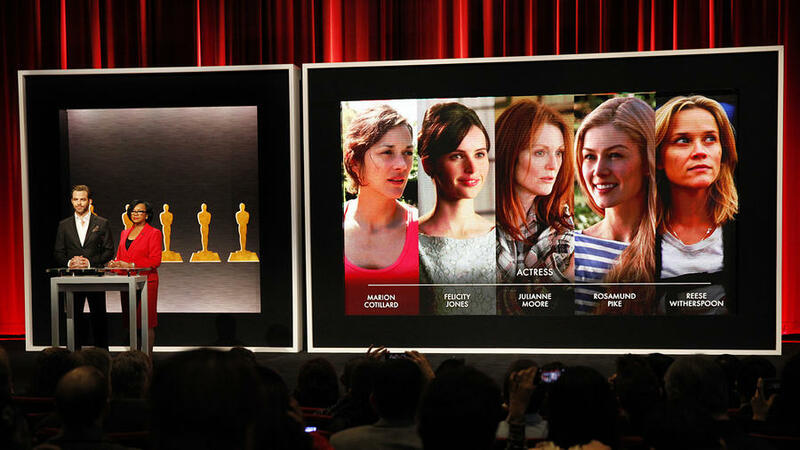 For the 2010 Oscars the decision was made to up the number of Best Picture nominees from five to as many as ten. It is widely believed that this was in response to Christopher Nolan’s The Dark Knight not receiving a Best Picture nomination in 2009. The belief was that a larger pool would make it easier for ‘non-traditional’ candidates to break into the field. However, while there was a full complement of ten nominees in 2010 and 2011, for the last three years there have been spots left vacant. So what is the go here? To combat the perception that doubling the number of nominees would result in a dilution of the prestige of a Best Picture nomination, the Academy made changes to the way the nominating system for Best Picture worked. Similar to political elections, Best Picture nominations are worked out using a preferential system, with Academy voters nominating their five candidates in order. When the votes are collected together a minimum number of votes to assure nomination is set by dividing the total number of votes by 11 and then rounding that figure up to the nearest whole number (dividing by eleven and rounding up ensures that it is not possible for more than ten films to reach the automatic nomination threshold). The first preferences are counted and any films which pass the set threshold on the first count are nominated. Then there is a redistribution of votes. Firstly, any films that receive less than 1% are dismissed and those votes redistributed to the second preference. Similarly, votes are redistributed from those films that pass the grade. For example, let’s say the film that earns the most nominations earns double the minimum vote requirement. What happens then is every vote for this film is halved, with half the vote going to the original film, so it still meets the minimum requirement, and half going to that voter’s second preference. This process is to ensure that even in years where there is a runaway favourite we still end up with at least five films in the pool. The flipside is that no film can be nominated without at least 5% of total ballots. This stops films being given nominations as place fillers when they don’t have enough legitimate support to warrant that spot, and explains why some years not all ten slots are filled. Nominations are conducted using both paper and online ballots, and the tabulation of the nominees is overseen by an accounting team from PricewaterhouseCoopers, who have been performing that function for over 80 years. So, then our nominees are announced and the campaigning begins to take home the gold statue. The Academy has strict regulations what is and isn’t allowed as part of a film’s Oscars campaign. With the majority of Academy members being located in either Los Angeles, New York or London, studios will organise screenings of nominated films with Q&A sessions with nominated individuals in those cities. However, they are only allowed to hold four screenings Academy voters screenings in any one city, and are not permitted to provide free food and beverages. Getting people to go out and see so many films can be tricky so studios will also send screener DVDs to the homes of voting members. Here the rules dictate that the DVDs must come in a plain case with only a “For your consideration” list on its jacket. The primary difference between the process for selecting the nominees and the process for selecting the winners is that once the nominees are selected all voting members of the Academy are entitled to vote in all categories. So while it is up to the cinematographers to decide which five films deserve nominations for their cinematography, all of the other branches get to weigh in on who deserves to win. This means the speciality element is removed. While the nominations for Sound Editing and Sound Mixing are put forward by those people who understand the difference between those two categories, everyone else gets a say in who wins them. This change in process can be significant because not all branches of the Academy are created equal. The actors branch is by far the largest in the Academy. It makes sense if you think about it. There are four acting awards each year with five nominees for each. So it is theoretically possible that twenty new actors could earn a nomination and join the Academy each year (ok, nineteen if we assume that Meryl Streep is an automatic nomination). As such, films that appeal to the sensibilities of actors are more likely to perform well in final voting. But while all voting members are entitled to vote in all categories there are some restrictions. In the Foreign Language Film, Documentary and Short Film categories, members are only eligible to vote if they have seen all of the nominated films. 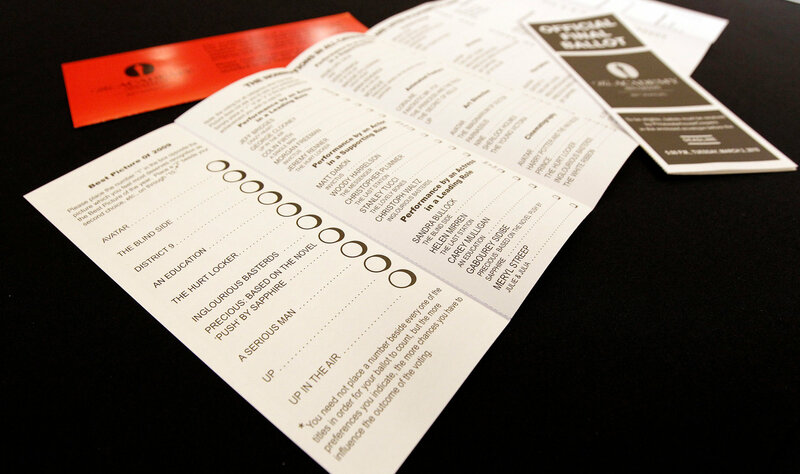 Again it is a secret ballot conducted on paper or online. For all categories except Best Picture the award is given to the top vote getter. The Best Picture category, like in the nominating stage, is a preferential system. A film must end up with 51% of the votes to win Best Picture. Voters are thus asked to rank the nominees from first to last. After the first round of counting, the film with the least number of votes will then have its votes redistributed to their second preference, and so on and so on until a film reaches the 51% mark. This system means that the film which ultimately wins is not necessarily the film that picked up the highest number of first place votes. Rather, it is the film which ranked highest across the board. So a very divisive film (think Tree of Life a couple of years ago) might pick up a number of high votes from its supporters, but would lose out from the low rankings it would get from those for whom it was not their cup of tea. The results are then tabulated by the people at PricewaterhouseCoopers and kept secret until the envelope is opened on stage at the Kodak Theatre on Oscar night.